What is the best way of reminding drivers that it’s time to purchase new winter tires? Place ads on the back of buses, where drivers can’t help but notice them — while stuck in Toronto’s notorious slow traffic. With only one billboard and a limited outdoor marketing budget, we created a clear and memorable ad message reinforcing our customer’s key strength – highly personal service that can only come from a family owned operation — and introducing new customers to their brand. 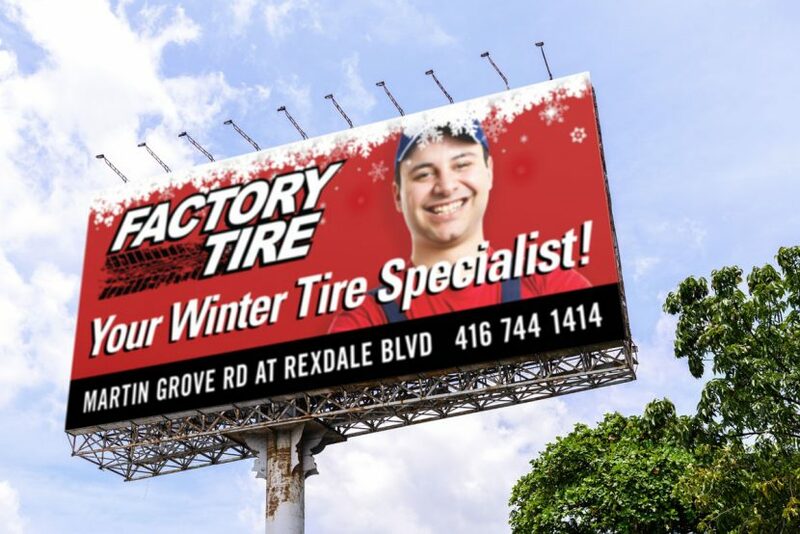 Located along one of Canada’s busiest highways, a large billboard goes up just before the winter season reminding drivers that winter tire season is just around the corner. A large “70 Poster” transit ad, displayed only on the back of busses, is the ideal method of drivers seeing the ad repeatedly while stuck in traffic. The larger more expensive side bus posters (called King Panels), while offering larger display areas would be less effective in reaching our customers target audience — drivers, as they will only really see those ads in their peripheral vision while driving (although bus side panels are perfect for more general targeted applications). Following up the billboard and the transit ad campaign with an unaddressed postcard mail-drop in the retailer’s general location, helps reinforce the campaign while adding a tactile touch-point for potential new customers. Direct mail is proving to be a more and more effective marketing method as other marketing moves to strictly digital channels. How much mail do you get versus your ever-overflowing email in-box? We can create a targeted campaign using the best of traditional and digital channels that will increase sales, help your bottom line and fit your budget. Give us a call at 416 534 4273 and let us help you break your sales records.